Disciple Now – 2019 is coming soon! Weekend activities begin on Friday, March 1st at 5 PM and continue until 10:45 AM on Sunday, March 3rd. Generation Multitask. It’s a fitting label for an overcommitted, over-entertained generation. School, sports, clubs, work, friends, family, church . . . Teenagers are more involved and committed than any group of teenagers before them. It’s no wonder that teenagers find it so difficult finding time to cultivate a relationship with Christ. They have to make time. 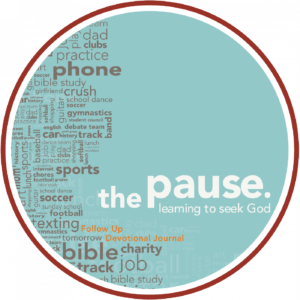 The Pause will teach students to “hit pause” and spend time growing their relationship with God. Guest speaker Addison Nieman, teacher and cross country coach at Roswell High School, will lead the large group discussion and Sunday morning worship. Special music presented by John Callaway.